I’ve somehow managed to avoid seeing any of Sam Raimi’s Spider-Man films, so it’s been good coming into these films with a fresh perspective. The first film from a couple of years back was a solid origin story, introducing the story of how Peter Parker became Spider-Man, introducing his relationship with Gwen Stacy and setting him off against a fairly poor villain in the lizard. 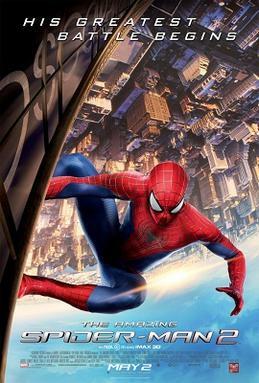 The second film begins where that film left off, but if anything, the main villian is worse and the overall story feels a little cluttered – it’s almost as if Marc Webb wanted to include as much ‘story’ in this film as possible without considering that too much is not always better (this could certainly explain why they filmed scenes with Shailene Woodley as a key character that ended up being cut). It’s not helped, for the second film I’ve seen in as many days, by another atrocious trailer campaign that managed to give away most of the main plot beats, leaving very little to the imagination going into the cinema. That being said, let’s talk about the good aspects first. Andrew Garfield is a very good Spider-Man, and he’s even better here than in the first film as his confidence has clearly grown in the role in tandem with Parker’s increased confidence as the superhero. His scenes with Emma Stone are highlights, and its here where Marc Webb does his best work, using his skills as a good alternative rom-com director to good effect. Stone is again very good as Gwen Stacy, gorgeous, sweet and cute, and she has also stepped up her performance from the first film. The supporting cast is where we enter into problems, with time only really given to developing two characters, Jamie Foxx’s Oscorp engineer Max Dillon, and Dane DeHaan’s billionaire Harry Osborn, the new owner of Oscorp after his father’s (Chris Cooper) death. Let’s deal with Foxx first, and it’s no spoiler to discuss his dual role as the unnoticed Dillon, and the film’s main villain Electro. In the first film, Rhys Ifans was excellent in the human role of Dr. Connors, adding a real sense of tragedy to his character’s arc, but the lizard made for a poor villain, with bad effects and not enough sense of threat – albeit this wasn’t Ifans fault. Jamie Foxx manages to be terrible as Dillon, and terrible as Electro, in one of his worst performances in some time. Dillon is no more than a superhero movie caricature, the downtrodden civilian who goes rogue when he develops superpowers – we’ve seen it all before and Foxx fails to ingrain any sense of tragedy into his performance and it comes off really poorly. The less said about Electro the better, but let’s just say he looks ridiculous, his dialogue is ridiculous and his fight scenes are so special effects heavy we barely know what’s going on. Moving on to DeHaan, who is one of the best young actors in the business, and he at least fares better than Jamie Foxx does. He’s very good as Harry Osborn, managing to strike the balance well between vulnerability and arrogance, and his tantalising friendship/alliance with Peter Parker is something I feel the film could have spent more time exploring. That’s what partly makes it so disappointing when his story is rushed along for the film’s conclusion which feels rushed, and doesn’t allow a key plot development the weighting it deserves. The film clocks in at 2 hours and 20 minutes, and that’s why its perhaps so disappointing that the ending is so rushed, and that every character outwith the ones I’ve mentioned feel nothing more than ciphers. I enjoyed the film, and I’m definitely looking forward to the next installment (and hopefully more of Paul Giamatti’s terrificly unhinged performance as a Russian terrorist), but this isn’t as good as the first film and has to go down as a disappointment.